Ben Hecht was a successful playwright and screenwriter from the 1930s through the 1950s, and an activist supporting Jewish and Israeli causes. His daughter Jenny was an actress who worked with the Living Theatre in its most productive period of the late 1960s. Larry Mollin’s play is built on a string of telephone and face-to-face conversations between father and daughter on the eve of her departure for Europe with the Living Theatre. Remove the Hecht name and you have a Clifford Odets family melodrama and, despite some interesting biographical titbits about both real-life figures, it is on that generic level that the play most fully resonates. The parent can only express his love by trying to keep his child safely on a short leash, while the daughter’s necessary fight for independence blinds her to the dangers she is rushing toward. Adding the Hecht name adds little to that, and Mollin does little to develop the characters or situation. Once the basic conflict is established, the two just repeatedly reiterate their arguments in slightly varying terms. Paul Easom nicely underplays Ben, adding individualised touches to the generic Jewish father. 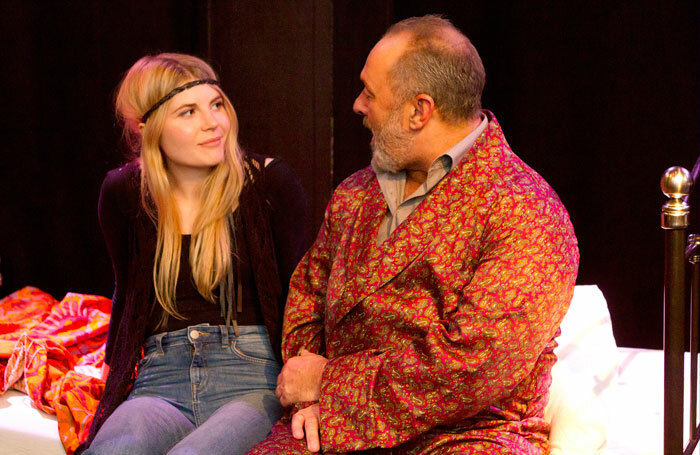 But the role of Jenny is written as so trapped within the hippie-flavoured vocabulary of her generation that Samantha Dakin has trouble finding a character behind the jargon and cliches. A pattern of small memory lapses, awkward blocking and jumped or missed cues suggests that director Anna Ostergren had insufficient rehearsal time.